In episode 70 astrologers Nick Dagan Best and Austin Coppock join the show to talk about Mars retrograde periods and their significance in astrology. 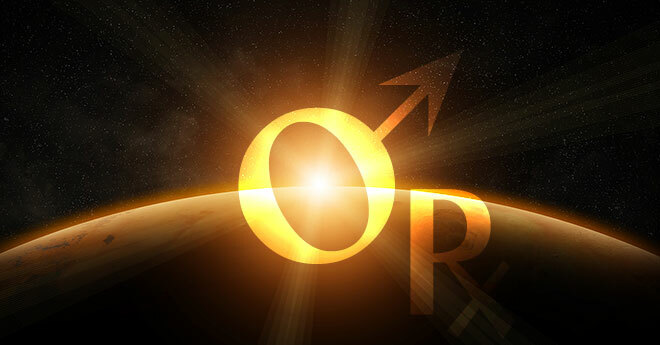 In particular was focus in on understanding the upcoming Mars retrograde period in Sagittarius and Scorpio that is set to begin in April of 2016. What does it mean when a planet or Mars in particular goes retrograde? Mars retrograde from an astronomical standpoint. What are the important points during a retrograde cycle? Retrograde cycles repeating in 15 year increments. How are retrograde cycles applied to natal charts in practice? What makes a chart more responsive to Mars retro than another? Things unique to this particular retrograde in Sagittarius/Scorpio. Stations RX April 17 at 8 Sagittarius, near the fixed star Antares. Opposition May 21/22 at 1/2 Sagittarius. Coincides with full Moon in Sag. Mercury also stations direct in Taurus then. Stations direct at 23 Scorpio June 29. Some tips for further study of Mars retro periods. Hindsite is 20/20: Most interesting correlation re specific,t major past events during Mars retrograde. Other major events do no correlate, and other Mars retrogrades do not bring anything big to mind. So Mars retrograde is not predictive in my case but confirming for some events. Data: Aries Sun, ruler Mars in Cap, ruler Saturn in 4th H (in Sag). IC also ruled by Mars. EVERY major relocation (foreign country, cross country, city to country, post divorce) has been during a Mars retrograde regardless of sign. Natal Mars is direct. This is now happening again with the double whammy with it being in the actual 4th H with 2 personal planets and the NN on Antares involved. Wow – Good to know that all these past events were very positive, liberating, regenerating moves regardless of the effort and courage they took. There was in every case a separation from a former life – very Martian theme. This one is really packed (no pun intended). good one again. How this runs will be -very- interesting. This one of those podcasts among the top 10. Thanks Chris, Nick & Austin. Very illuminating. Awesome podcast! This series is the finest in astrology podcasts. Thank you guys for your hard work. Fantastic show! Kudos to Chris for sometimes simply sitting back and letting the Masters Minds of Mars rave. Nick and Austin were truly awesome. Thanks for a truly great show. See ya at the station. Very,very interesting discussion. In particular was the subject of Hillary’s correct birth date. The significant events in her life occurring in late Gemini and Cancer does point to this area as a possible ascendant in an evening birth. There is another possible reason why early Cancer is an active area. This can be seen when we look at her Venus Star Point. ( reference A. Guttman’s Venus Star Rising”) The technique is to locate the Venus Sun conjunction immediately prior to birth then plot zodiacal degrees of the other four Sun/Venus conjunctions that will occur during the following 8 years whence Venus returns within 2 degrees of its position at the beginning of the cycle. Hillary’s Venus Star Point is the Superior conjunction on September 3 1947 at 10 Virgo 14. The four subsequent superior conjunctions followed at 26 Aries on 4/16/49, 21 Scorpio, 11/14/50, 3 Cancer 6/24/52, 9 Aquarius 1/30/54, with the cycle completing on 9/1/55 at 8 Virgo. On January 20, 1993 Bill is sworn in as U.S. President. Announces formation of Presidential exploratory committee January 20 2007. The U.S. diplomatic mission in Benghazi, Libya is attacked on September 11, 2012, in December she has brain blood clot and intestinal viral infection. Mars retrograde phase January 24, 2012 @ 23 Virgo to April 14, 2012 @ 3 Virgo conjunction with Venus star point at 10 Virgo. Nice show ! Nick pointed out that Mars is about division (and Venus is the opposite of that). I find interesting that the world “devil” comes from the greek word “diábolos”, which means “the one who brings division”. @Sebastien – and the devil is almost always depicted in red with the hot flames of hell . Saturn too is about division (severing) and I find it interesting that he is Satan as well – just not so red and not so hot, rather, stone cold. Yes that’s very interesting, the Devil is hot red and Satan is cold black. The more I study this topic, the more I think Satan and the Devil really are two distinct characters. They are the two malefics we find in almost every spiritual traditions. By the way, in French, the translation of “hell” is “enfer”, literally “en fer”, “made of iron”, the alchemical metal of Mars. So I tend to think that the hell that Christian people fear so much is really just about alchemy. This is a big topic – the whole concept of hell and the history of the meaning, the etymology of the different languages (English meaning of hell is covered or hidden for example). Very interesting that the Latin inferno is about iron. Ladies, don’t fail to listen all the way to the end. C’mon I know you sometimes bail out before the very end of the show or skip forward and backward. But you MUST listen all the way to the end to hear Austin’s comments on the “dude-a-rang”. I hope I’m spelling that right. It’s the guy who comes back on the Mars retrograde, and of course may or may not stay when Mars proceeds. It explains something that just happened to me, and might be useful to highlight in your ephemeris. Then you’ll know what’s going on when Romeo of yesteryear calls…..and what to do about him. Could #NuitDebout (#NightOnOurFeet) start a French spring ? It’s funny they choose the night to protest : is this Mars calling ? This was very interesting and insightful. Thanks for speaking about this topic. I have Saturn at 7 degrees Sag in the 3rd house in a wide conj with Mars which is in Scorpio in my 2nd house, along with my Pluto and South Node. So this Mars ret feels important for me. I started contracting as a web development engineer for a high-profile company a few days before Mars went retrograde and its probably the most mentally challenging work I’ve done to date. The contracting process is long and drawn out and I won’t know for at least a few months whether they will hire me as a full-time employee. I’m also about to start speaking at many conferences in my industry. Public speaking generally terrifies me, so this is another 3rd house challenge coming up for me. I’m looking forward to it but I know it will be a slog. You mentioned several events that happened around the time I was born (the Punisher comic first issues, and the Mir space station launch) and it was interesting to hear about the astrology of those events. Fascinating discussion. So pleased to tune in and get enlightened about this Mars retrograde, in my 12th houses. Hmmm! Too much war, more humour huh! I agree that Hillary is most probably a Cancer rising. She has a very moon shaped round face, don’t you think? Not sure if this is still an issue, but the mouse clicking in this podcast, as well in other past podcasts, is significantly distractinf/annoying.